Nick McBride has continued his hot form at Sandown with victory in the opening Carrera Cup race of the weekend. McBride, who was fastest in practice before taking pole earlier today, got the jump off the start to head Sonic Motor Racing team-mate Andre Heimgartner. Jaxon Evans was to share the front row, but he broke a drive shaft on the warm-up lap and had to watch from the sidelines. 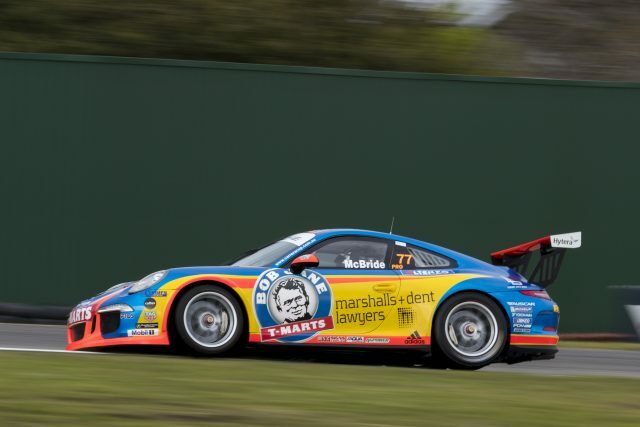 The Sonic duo skipped out to a handy lead, while GT3 Cup Challenge winner Jordan Love soon came under pressure from Alex Davison. After holding out for six laps, Love skipped across the grass heading into Dandenong Rd corner and soon after Davison was through, follow by points leader David Wall. Davison closed the gap to Heimgartner, which eased the pressure on McBride through to the finish. The Tag Heuer Carrera Challenge saw a great fight between Sam Shahin, Stephen Grove and Tim Miles. Each led at one stage, before Shahin spun and then Miles passed Grove late. The second race of the weekend will be later this afternoon.